While we were driving through Wichita, we both noticed a developing cumulus field in southwest Kansas. Shortly after the SPC issued a mesoscale discussion regarding the same matter. As we drove north on I-35 we considered whether or not storms that fired there would be worth a play, after all it was really early in the day, not even 10am yet. We continued on and as we approached I-70 near Salina, we both got the inkling that the Nebraska target wasn’t going to pan out, the warm front hadn’t surged as far north as models were indicating, and the entire area was socked in heavy clouds. At the same time, storms started firing in western Kansas and were tracking northeast. Once we reached I-70, we made the decision to get in position to play these early storms. Construction on I-70 made it difficult to find a decent exit with a good north road option as exits were intermittently closed. Eventually we got off and headed north towards Luray. It was here we got our first look at one of the storms. It looked rather marginal so we went east to try and find a spot to watch the next storm in line come through. We sat on a nice hill near Sylvan Grove and watched to the southwest as the high-precip storm moved in our direction. It went tornado warned shortly after we arrived and as it trundled to the northeast, we decided to stay ahead of it, so we hopped in our cars and headed north on 181. We went through Hunter and stopped 3.5 miles south of Tipton where we started seeing the tell-tale rain curtains dancing in a field to our west. I decided we could inch up a bit closer and continued north on 181 until we got to 180th drive, about 2 miles south of Tipton. 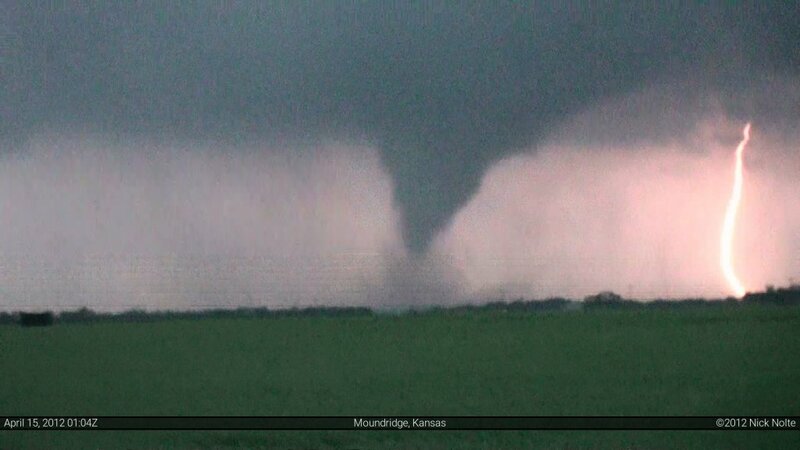 Here we pulled off on the east side of the intersection right across from a local sheriff who was out spotting. Boy, was he in for a surprise. Soon the rain started to fall rather heavily, and the rain curtains we once saw in the field next to us had become obscured by precipitation. Soon the wind ramped up extremely quickly blowing from east to west at 50 or 60mph. I knew if there was a tornado in the rain, it should pass to our north, but it was going to be close. Not long after that thought, the winds ramped up even more to the 80-90mph threshold and our cars began to shake rather modestly. I kept my eyes on the rain to make sure it kept blowing away from us and that there were no sudden wind shifts. Our cars were pointed towards the main road so if we needed to blast back south, quickly, we could. The wind continued it’s assault on our vehicles as it slowly veered from east to southeast, then to south and finally from the southwest. After about six or seven minutes of the ordeal, the wind subsided. 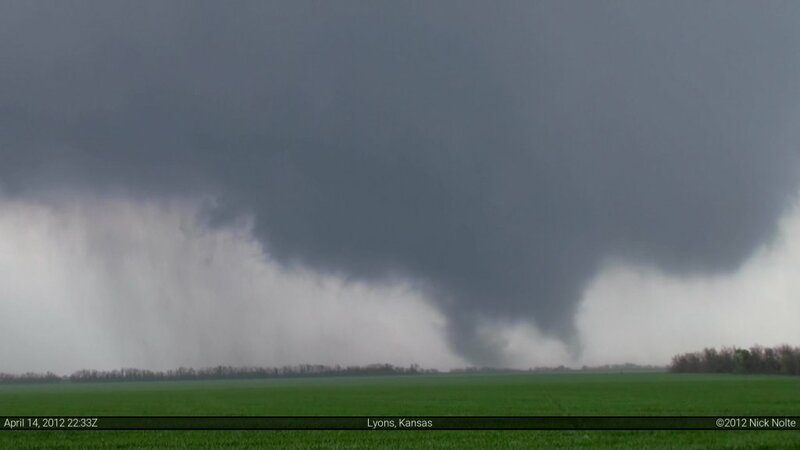 Jon an I had figured we were in the inflow jet and the tornado had passed a 1/4 mile, or so, to our north. A couple of days later, Hastings released their survey of the tornado which revealed that we weren’t as far away as we had thought. Our location was nearly in the middle of the damage path and we had, in fact, been in the southeastern portion of the tornadic circulation. A garage 700 feet to our east had been destroyed, as well as several other outbuildings west of us. 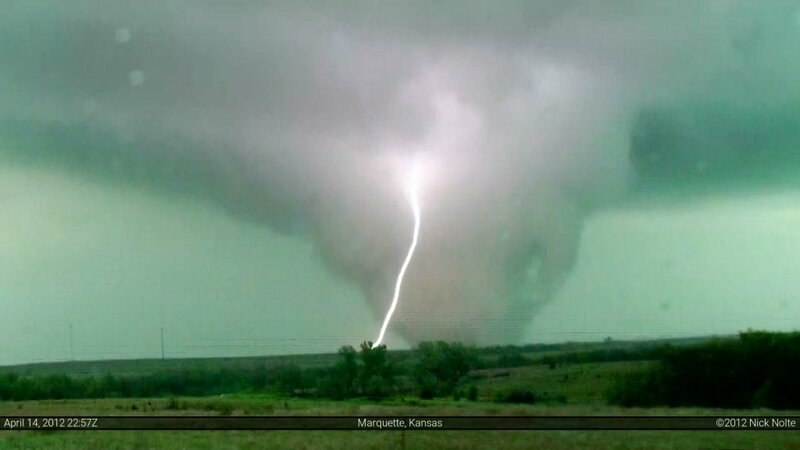 This tornado was rated EF-1. You can view this portion of the chase in the first two minutes of the video below. We attempted to keep up with the storm after it passed us, but flash flooding thwarted our attempt at a second look. Ditches alongside the road had become raging rivers and several spots along the road were awash with runoff from agricultural fields. We stopped briefly on Road 380 to discuss whether or not to stay with this storm. 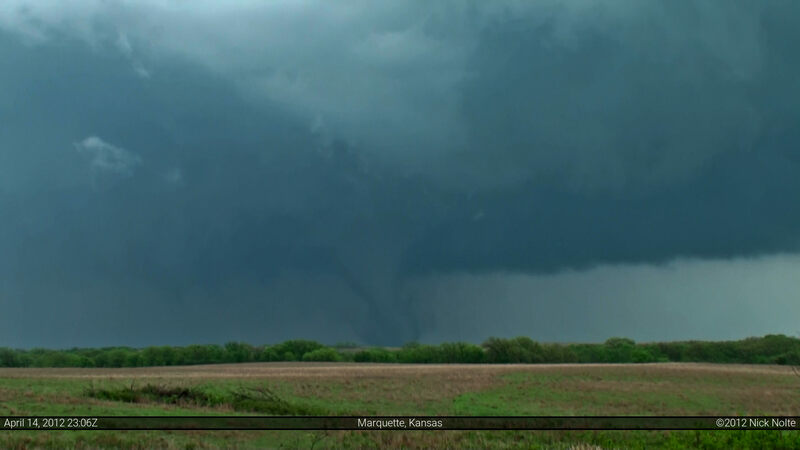 We decided that getting any sort of visual on a tornado would be impossible given the high precipitation nature of the storms that we decided to head south and intercept the developing supercells southwest of McPherson. We were almost back to highway 14, just south of Beloit, when we came across a flooded section of road that was several hundred yards long. We made the decision it could be impassible and turned around and headed back the way we came. As we traveled back through Tipton, and past the spot where we had just sat in a tornado, we noticed some scattered debris around, sheet metal and the like, but nothing serious. We continued back south through Ellsworth and Pollard and just southwest of Lyons where we finally got on a good looking supercell. 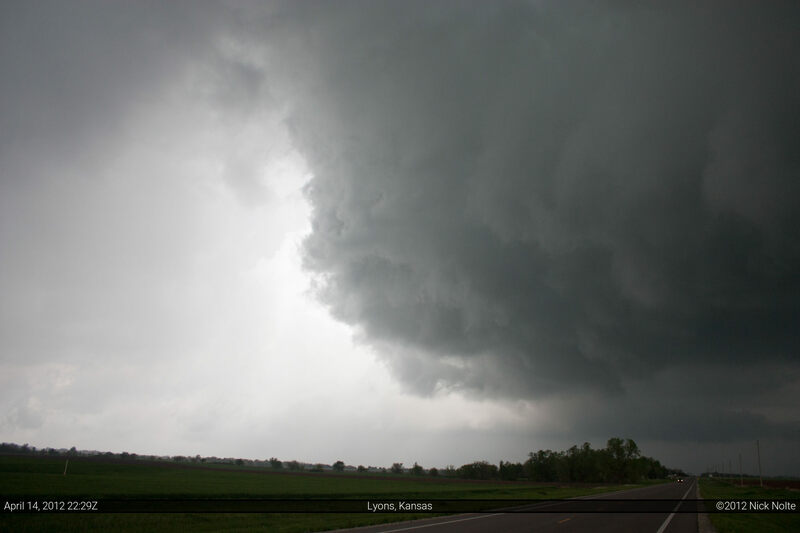 Just north of Lyons we pulled off and watched as a new wall cloud began to form and a new RFD was slicing a beautiful clear slot through the back of the storm. The motion in the clouds was pretty impressive and we both commented that this storm might get it done. So we moved a bit north on highway 14 when, just south of Pollard, I noticed the wall cloud wrapping up extremely quickly. A small needle funnel developed and I found the first spot I could to pull off. 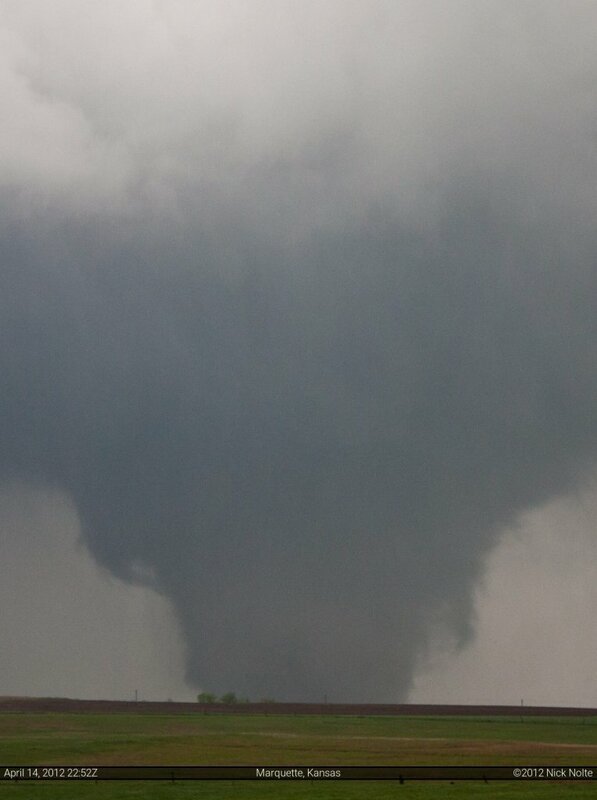 As soon as I got out of the car, the funnel had descended to the ground and quickly became a large wedge tornado. 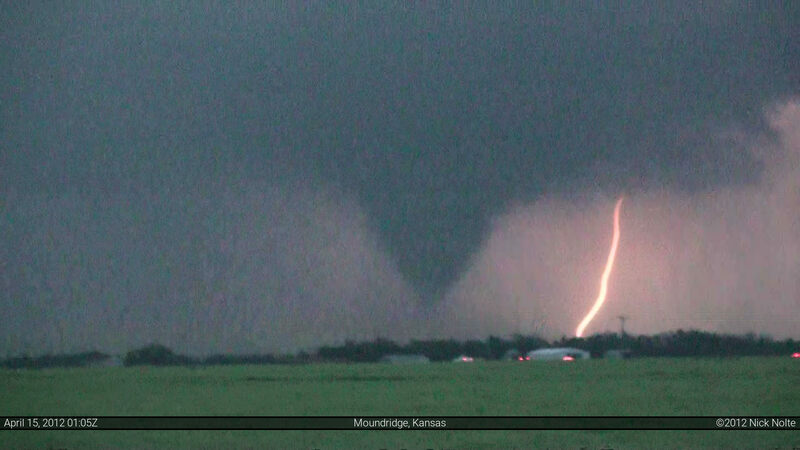 I filmed there for a bit before hopping in the car to keep up with the storm. I continued north on 14 to Ave E and took that to 19th Rd so I could meet up with highway 4 after Geneseo and avoid driving through town. I pulled off the road again just northwest of Crawford to observe the large tornado move to the northeast near Langley. 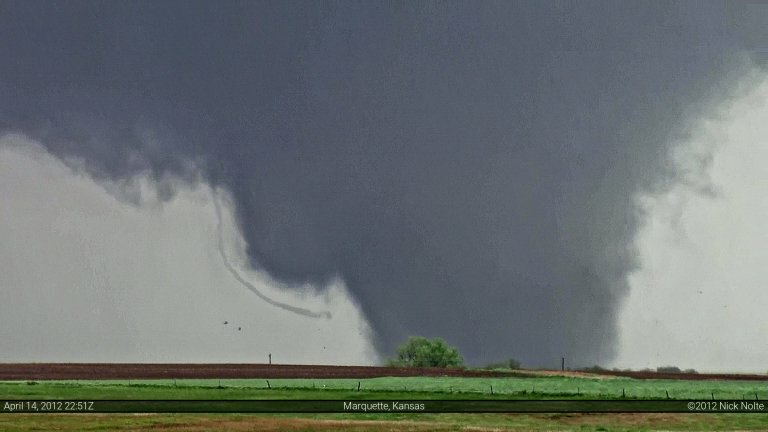 We continued on and found a nice hilltop turnoff near the 4/141 intersection where we got to watch the large tornado continue on it’s northeasterly track just north of Langley. 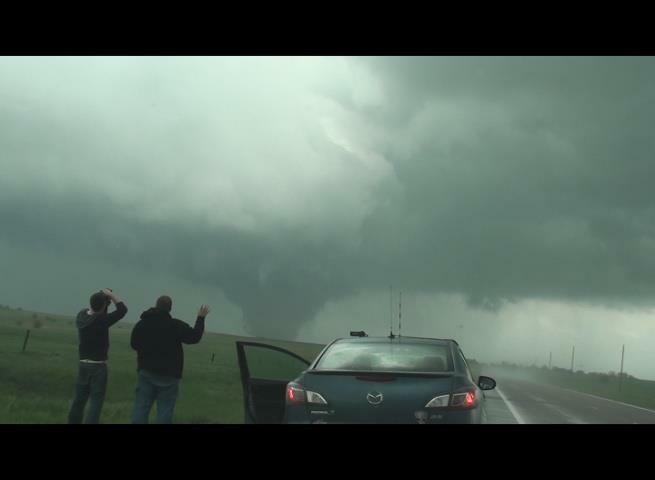 It had already crossed highway 4 at this point, so we headed north on 141 for a bit and found another nice pulloff to watch the tornado for a few more minutes east of Kanopolis Lake. After a bit we decided to try and keep up with it, but dirt roads prevented us from catching back up to it. Once we found pavement again west of Falan, we had a discussion on whether or not to call it a day and go have dinner. As we approached I-135 we decided that we would be able to intercept the storms that were firing near Hutchinson before they crossed I-135, so we went for it. 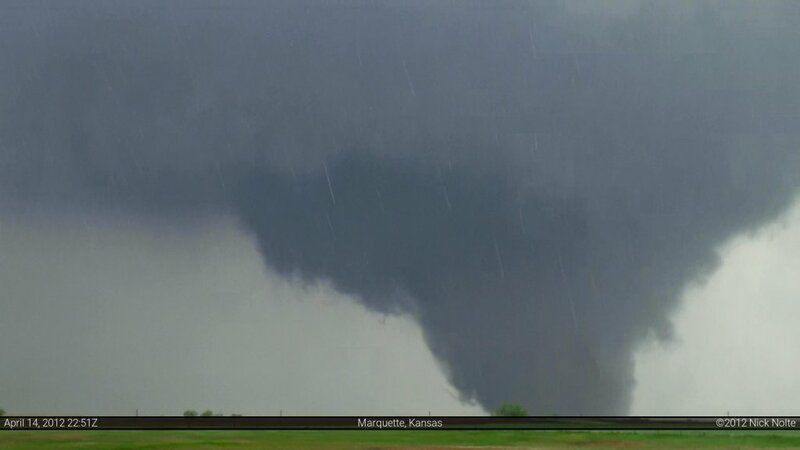 We got off the interstate near Hesston and went south to Halstead where we finally got a visual on the base. Dark was starting to descend on us and there wouldn’t be much light left. The base of the storm looked decently organized so we stuck with it and just southwest of Hesston it dropped our third tornado of the day. After crossing I-135 and trying to keep up with the storm on dirt roads, we decided to call it a chase since it was dark and we felt we couldn’t get back on the storm. 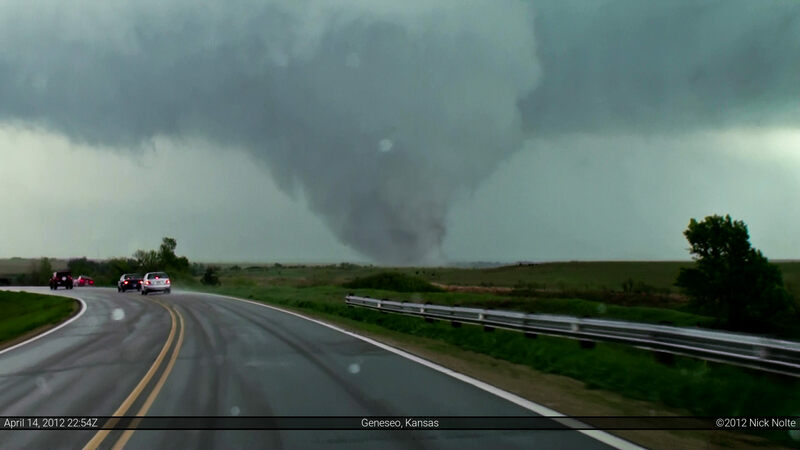 We proceeded from there to Emporia where we had dinner and ended a successful chase day. 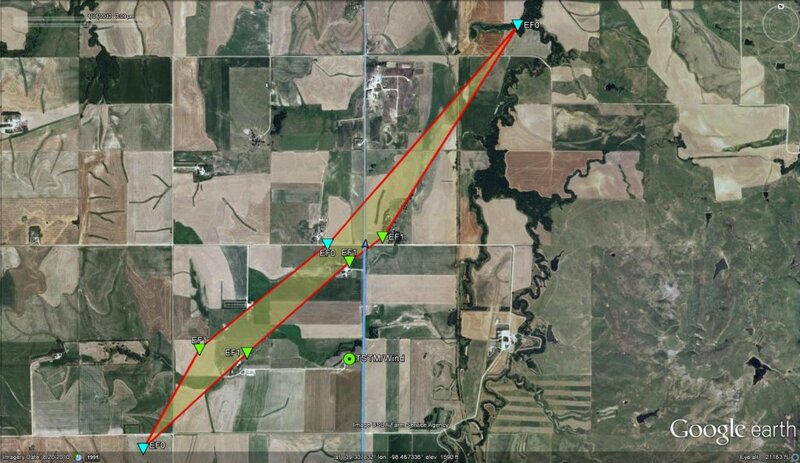 All in all, a successful day where we, literally, intercepted the EF-1 tornado near Tipton. 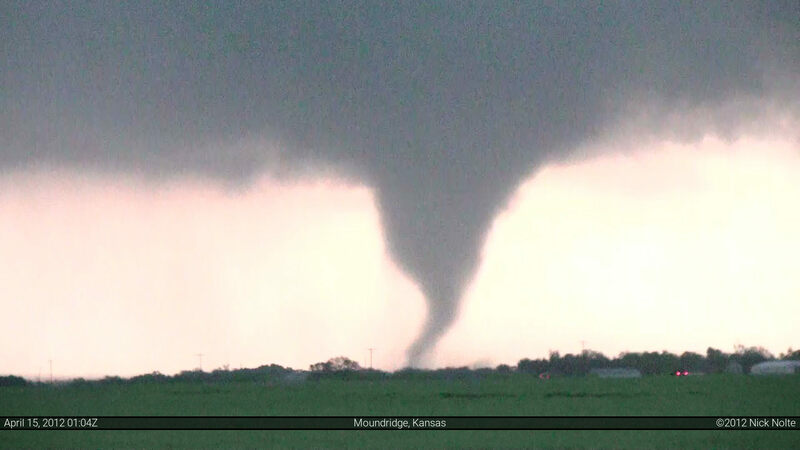 Got stunning views of the EF-4 Langley tornado, and intercepted the EF-1 Hesston/Moundridge tornado right at dusk. These were my first Kansas tornadoes.